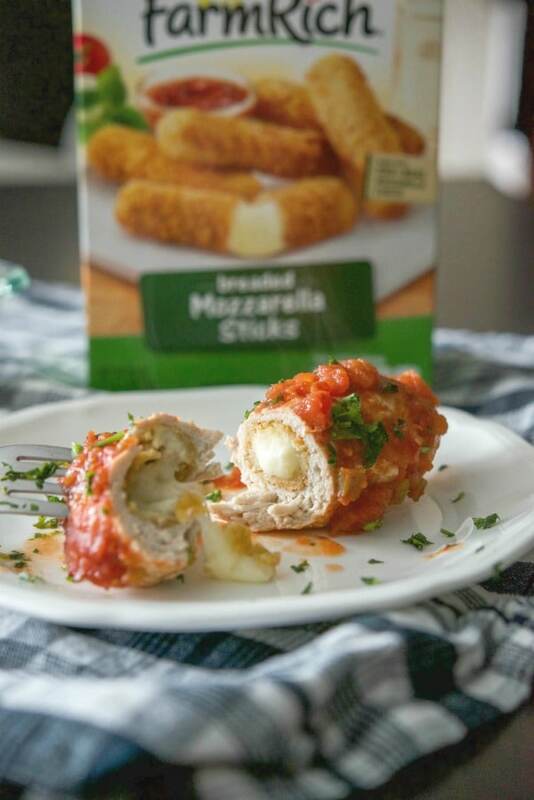 Cheesy Mexican Ground Turkey Roll Ups made with Farm Rich Mozzarella Sticks, wrapped with extra lean ground turkey; then topped with your favorite salsa. A quick and easy meal the kids will love! *This post has been sponsored by Farm Rich. All opinions are my own. Cinco de Mayo is just around the corner so I partnered with Farm Rich to create a simple weeknight meal to celebrate the occasion. 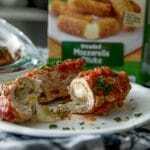 They have so many products to choose from so I wasn’t quite sure what I was going to make at first, but since my kids love mozzarella sticks, I opted to use those to make these Cheesy Mexican Ground Turkey Roll Ups. Though my kids are now 20 and 15, my youngest was just 9 years old when I started this blog. Needless to say, her food palette was pretty limited, until I started to engage her in our nightly meal prep by helping in the kitchen and going to the store and letting her find at least one new item she was going to try that week. It also didn’t hurt that she wanted to eat the food I was putting on the “special blog plates” (a.k.a. the ones I use to take my photos on). After a while, she outgrew the frozen chicken nugget stage and now is even more adventurous than I am with new foods. Kids love being a part of something and for me, I always enjoyed learning and cooking in the kitchen with my family; which is what I’ve tried to instill in my two girls. 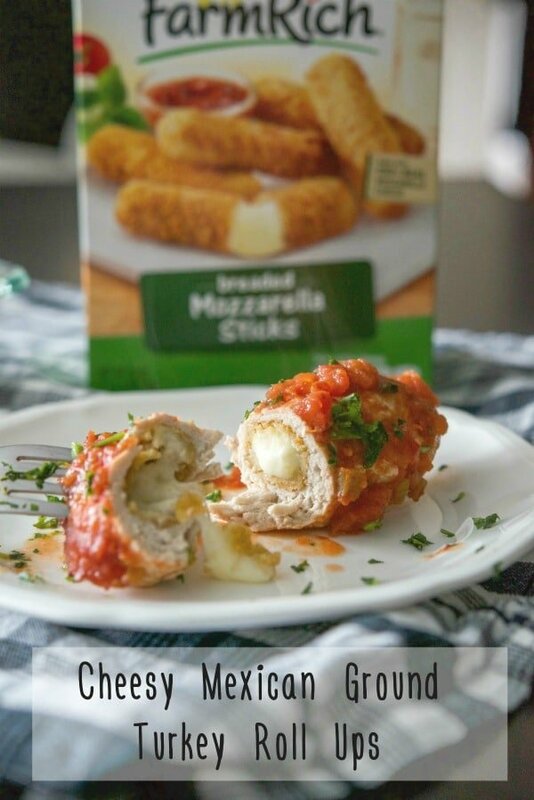 This recipe is great for those just learning to cook because you only need three ingredients: Farm Rich breaded Mozzarella Sticks; which are made with 100% mozzarella cheese and serve as a good source of calcium and protein, extra lean ground turkey and a jar of your favorite salsa–hot, medium or mild, you decide! To make this recipe, start by preheating your oven to 425°F. Separate your ground turkey into six portions; then form the meat around one frozen Mozzarella Stick and place in an oven safe baking dish. Repeat for all six portions. Next, pour the jar of salsa over the roll ups, spreading it so that all of the roll ups are all covered with the sauce; then place in the oven and bake for 30 minutes until the turkey is cooked through and white in color; then take a bite and watch the cheese just ooze from the center! 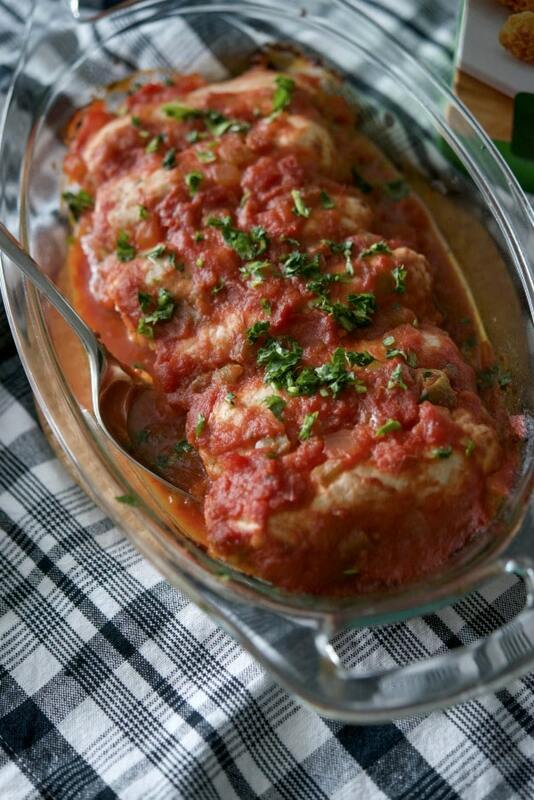 See how easy this recipe is and it was pretty tasty too! Each roll up has only 195 calories, 21g protein, 6g fat and contains Vitamins A and C, Calcium and Iron so you can feel good about serving this to your family. 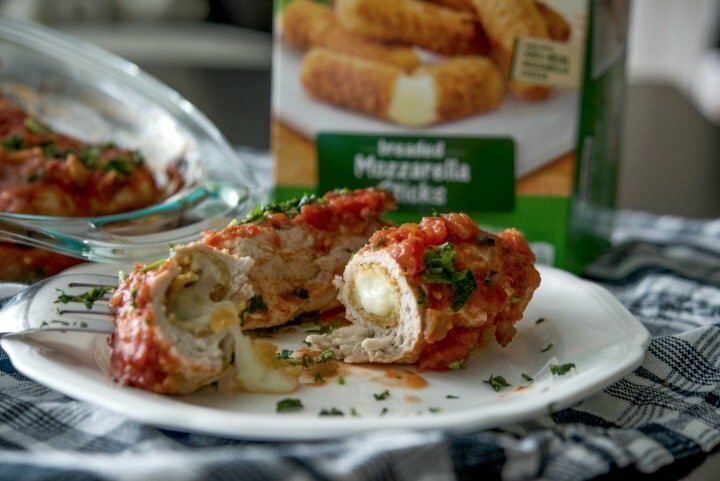 These Cheesy Mexican Ground Turkey Roll Ups made with Farm Rich breaded Mozzarella Sticks will definitely add some fun to your Cinco de Mayo dinner celebrations. ~Enjoy! Separate your ground turkey into six portions; then form the meat around one frozen mozzarella stick and place in an oven safe baking dish. Repeat for all six portions. Next, pour the jar of salsa over the roll ups, spreading it so that all of the roll ups are all covered with the sauce; then place in the oven and bake for 30 minutes until the turkey is cooked through and white in color. Farm Rich snacks, appetizers and breakfast foods are made with wholesome ingredients, quick-frozen and carefully packaged so busy families can prepare great-tasting food within minutes. For busy parents who want to raise good kids and have happy families, Farm Rich is the brand that celebrates doing it “your way”. Sign up for the Farm Rich email newsletter to receive exclusive offers, recipes, tips, hack ideas, and promotions.